It’s easy to maximize even the tiniest garden space when you look up – and up, and up, and up. Whether you have a balcony, deck, small terrace, raised beds or container garden, vertical gardening is a great way to increase your cultivated ground and enjoy a more abundant harvest no matter how small your garden may be. 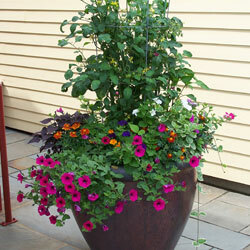 Containers don’t have to be at ground level to be useful gardening space. Adding window boxes above a flower bed, for example, will give you more space to grow your favorite flowers, herbs or other plants. 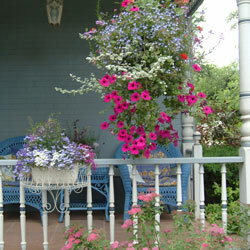 Some boxes can also be mounted on railings, adding extra growing space to a deck or balcony. 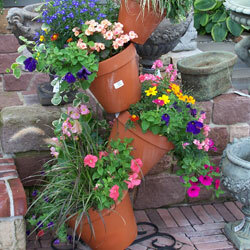 Different sizes of pots and containers can be nested together to create a gardening tower perfect for trailing plants. Think from the top down when you opt for hanging pots or sleeve garden systems as part of your vertical gardening approach. Pots can be hung from hooks along a wall or fence, or may hang from an overhanging roof or the arch of an arbor, and each one is another opportunity to add more plants to your growing space. Train different plants to take advantage of vertical space by providing trellises for them to use as they grow. Many vines and climbing plants will naturally make their way up different supports, whether the trellis is wood, plastic, wire or string. A-frame and teepee-style trellises can provide even more support for heavier plants that require extra help. A full green wall is a great way to verticalize your growing space, and can even be done indoors if desired. Small pots or creative containers such as rain boots, garden shoes, mason jars, small tin pails or plastic bottles can be attached to a fence or wall, or a pallet can be designed as a vertical gardening space to be hung on a wall to maximize every inch. 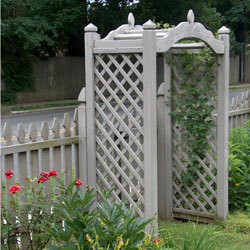 Arbors and archways can add to your gardening space as well as make a welcoming accent to the area. The sides of an arbor can be used as a trellis, and hooks can be added on the sides and top of an arbor for more hanging pots. Some arbors even have built-in containers for more convenient gardening. Larger than basic containers or planting pots, shelf gardening systems truly make the most of every bit of space by adding extra tiers to the gardening area. These broad gardening shelves are useful for a wide range of plants and seedlings, and are great to add to any smaller garden in need of extra space. A cinderblock divider or wall can easily become a fun vertical planter when the blocks are oriented to provide small spaces to use as different pots. Trailing plants are ideal for this type of space as they will drape down and cover the other exposed blocks, and the blocks themselves add visual and textural interest to small spaces. In addition to these delicious edibles, a vertical garden can also be filled in with colorful flowers, ferns, succulents and ivy. These extra plants can help beautify your small space and fill in gaps so every inch of gardening space is richly used. To make sure your vertical garden thrives, it is vital to water it properly, as vertical gardens will dry out more quickly than a traditional garden. A watering wand can help water hanging containers or higher vertical spots more easily, and grouping plants with similar watering needs together can make this task easier. Good fertilizer is also essential to be sure plants get enough nutrition to grow properly, but choose the type of fertilizer carefully to support your plants – leafy greens and foliage plants, for example, need a different fertilizer composition than flowers, fruits or vegetables. Use pot feet, casters or wheeled stands whenever possible so you can rotate plants to get even sun exposure or to move vertical gardening arrangements into more suitable locations as seasons change. To help support taller plants, different stakes, cages and other supports can be useful and will help increase your gardening space even further. Once you start thinking “up” instead of “out” for your garden, you’ll be surprised at just how much gardening space you really have, and how many different plants you can enjoy at all different levels.